Continuing a tradition of one, a quick post to illustrate where/what Savinja is to friends asking about our second daughter’s name, and again to explain a recent absence to Flickr contacts! Per TS Eliot’s theory on the naming of cats (see below), we felt she, like Jessica, would need “a name that’s particular, A name that’s peculiar, and more dignified…” to her day to day Sophie. The Savinja river starts way up at the end of Logarksa Dolina, shown here, and the stream flows just left of the shot. A few of my other pictures show how it rushes under a crust of snow, even through caves of snow further up the valley. 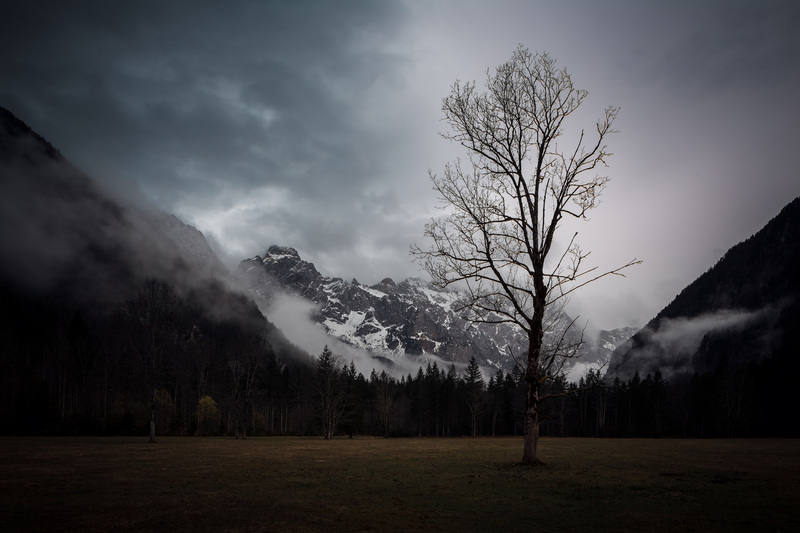 The photo itself is something of a poster child for my general Slovenia experience – walk out somewhere engaging in the light, shoot, then walk back in utter terror once night has fallen. Originally I shot this with black and white in mind, and processed it as such, yet in the final stages I flicked back to colour briefly and so liked this eerie oil paint palette I thought I’d take a risk and leave it as is. Thanks to Ursa and family at Lenar Farm with whom we’ll hopefully be staying again next summer in Logarska Dolina, who kindly confirmed that Savinja didn’t have any unintended or strange meanings in Slovene. If you’re heading to Slovenia and fancy waking up looking at this, I can recommend the Lenar Farm as one of the best places a person can stay anywhere on Earth! And Sophie Savinja Howarth she would have been, but born on my late Grandmother Verona’s birthday, she earned an additional name as a bonus. We’d in fact discussed Verona as a name previously, and only stopped short on the basis that we didn’t know the city. Given the specious day of her birth, however, we took the view that knowing the force of personality was justification enough to trump any mere city. Anyway – thank you to all the kind well wishers on email and Facebook. For reference; The Naming Of Cats by T. S. Eliot The Naming of Cats is a difficult matter, It isn’t just one of your holiday games; You may think at first I’m as mad as a hatter When I tell you, a cat must have THREE DIFFERENT NAMES. First of all, there’s the name that the family use daily, Such as Peter, Augustus, Alonzo or James, Such as Victor or Jonathan, George or Bill Bailey– All of them sensible everyday names. There are fancier names if you think they sound sweeter, Some for the gentlemen, some for the dames: Such as Plato, Admetus, Electra, Demeter– But all of them sensible everyday names. But I tell you, a cat needs a name that’s particular, A name that’s peculiar, and more dignified, Else how can he keep up his tail perpendicular, Or spread out his whiskers, or cherish his pride? Of names of this kind, I can give you a quorum, Such as Munkustrap, Quaxo, or Coricopat, Such as Bombalurina, or else Jellylorum- Names that never belong to more than one cat. But above and beyond there’s still one name left over, And that is the name that you never will guess; The name that no human research can discover– But THE CAT HIMSELF KNOWS, and will never confess. When you notice a cat in profound meditation, The reason, I tell you, is always the same: His mind is engaged in a rapt contemplation Of the thought, of the thought, of the thought of his name: His ineffable effable Effanineffable Deep and inscrutable singular Name.